Show Me Route 66 Magazine / Volume 27 no. 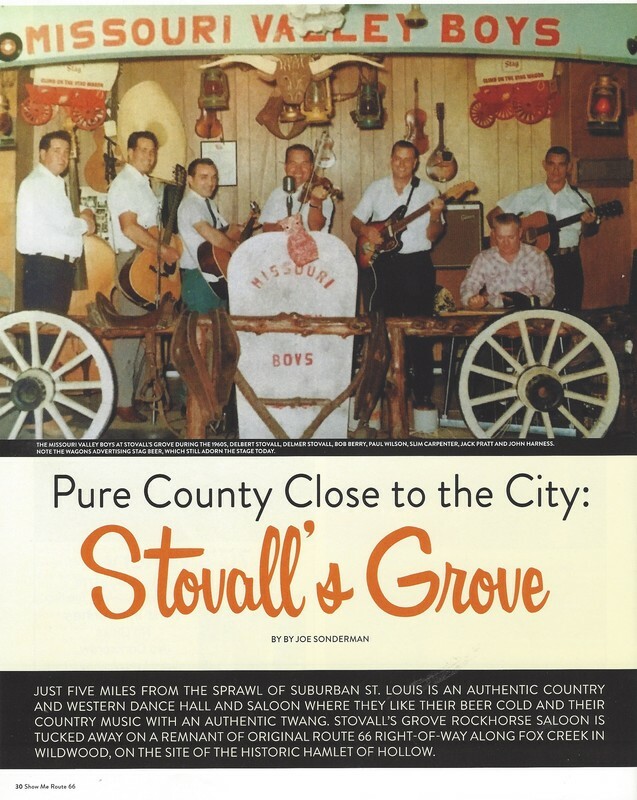 1 2017, quarterly publication of the Route 66 Association of Missouri, "Pure Country Close to the City - Stovall's Grove," by Sonderman, Joe, pp. 30-32,. The Route 66 Association held their quarterly meeting at Stovalls Grove earlier this year. 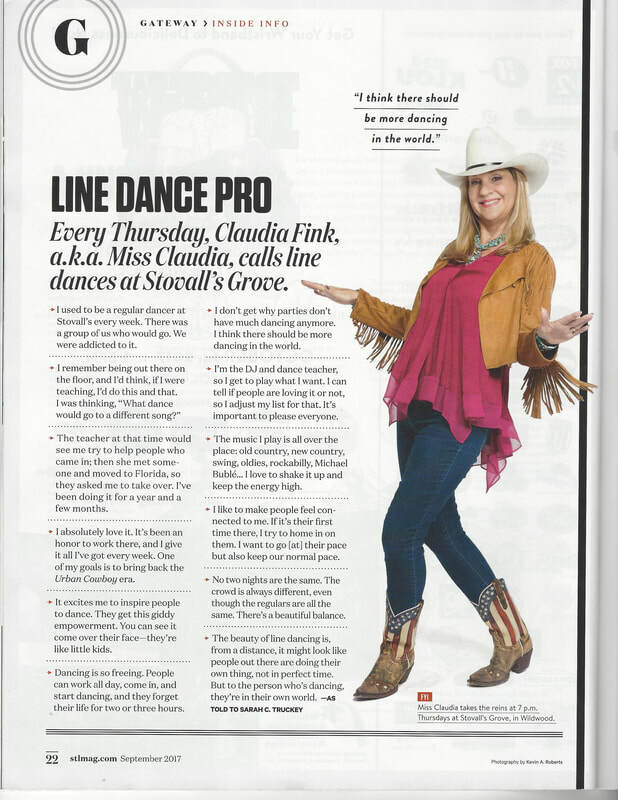 Thanks for the great writeup! 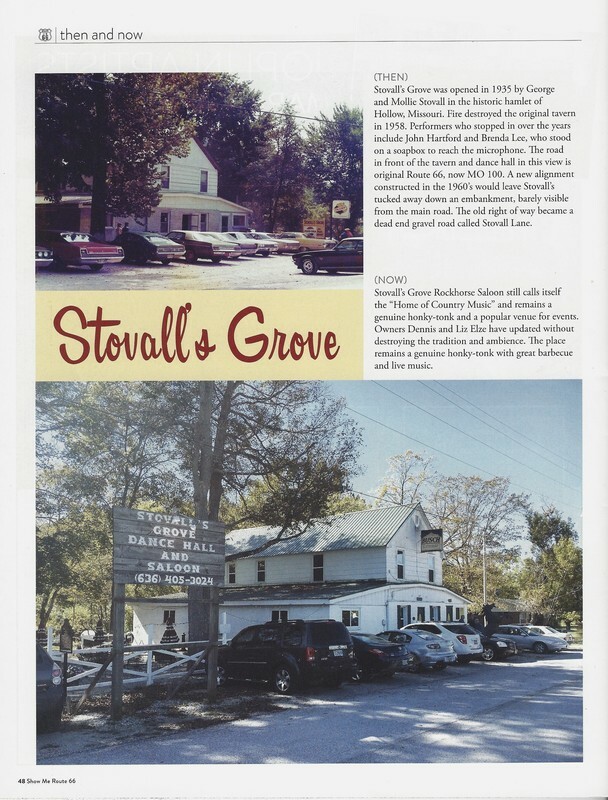 For more than 20 years Stovall’s Grove has been a popular gathering place for real country fans. It is not unusual to see entire families with small children in the club and grandmothers are frequently seen on the dance floor. You will also find well dressed business executives and farmers in bib overalls. When the band leader Paul Wilson or one of the Stovall's see someone they recognize (and they eventually get to know about everyone there) they will often announce over the PA that they are happy to see them that evening. You can get a sandwich and coffee and in the summertime their outside bar-be-que stand is kept busy. Of course other refreshments are served as well. Stovalls grove is locate at Hollow Missouri on Highway 100 approximately 7 miles west of Ballwin. Each member of the Missouri Valley Boy have a rich background in country music and they play bluegrass at it’s best. Now we would like you to meet Paul Wilson and the Missouri Valley Boys. My parents lived on a small farm about seven miles southwest of Eureka, MO., known as La Barque Creek. I was one of seven children born on La Barque Creek. Growing up my parents were moving around quite a lot from Jefferson, Franklin, and St. Louis county, we finally lived on this farm only about a mile from where I was born, and electricity had just come through this area. So dad bought a radio and on Saturday nights I would listen to the Grand Old Opry. It was there that I really took a liking to fiddle tunes. Dad had a fiddle loaned out and had just got it back. So I started see-sawing around on this old fiddle. After three months and nearly driving my mother crazy I struck my first tune. Then for the next year I would practice on different tunes. Then I met this fellow who played guitar and we got our first job playing for house parties and pie supper socials. This went on for around a year, then we landed a job playing in Saturday dances for the next couple of years. I really thought back then this was great we received $3 a piece and fried chicken gravey (sic) and biscuits after the dance. Then it was off to the Army for two years during World War II. Out of the service in the fall, I didn’t play hardly at all til 1948. It was in the spring of 48 that I got on as fiddler at a small dance hall in Jetburg, MO. From there I was playing for the next year around the later part of 1949. I formed my own five piece string band. We played on radio station KWRE St. Charles, MO, the next year and all over for the next four years. At this time it was getting rather hard to keep fellows because of my family duties. So my band broke up in 1953. In spring of 1954 I joined a band in St. Louis playing Friday and Saturday nights. Also playing over radio station KJCF out of Festus MO, one hour on Saturday mornings. We were also making some guest appearances on TV Channel two in St. Louis. It was there we landed our first booking for nine days at the Missouri State Fair, in Sedalia. While there we had to play several 15 minute shows over a TV station, for our sponsor who was Pepsi Cola. Coming back and playing the next couple of years all over, throughout the St. Louis area the band broke up. Now for the next five years I didn’t play much. 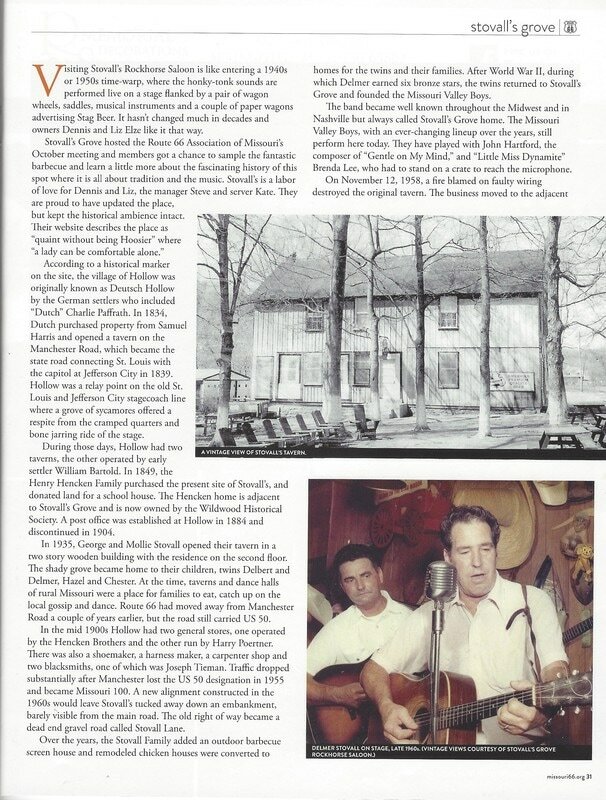 Then in June of 1961 I joined the Missouri Valley Boys Band, band at Stovall’s Grove in Hollow, Mo. I’m mighty proud to say I have played with some real fine fellows throughout these last eleven years. And met some of the nicest and most wonderful people there. I can only say I love playing country fiddle and especially country music. Just hope you folks come to see us some Saturday night. Here is a country singer who has loved country music since a little boy. He used to put the old ear phones from an old Crystal radio over his ears and listen to hillbilly music. John was born in Glencoe, Missouri some fifty years ago and he is still right there in Glencoe, although he started singing with bands at the age of sixteen he didn’t get into the grove until 1942 at the age of twenty. He played with a group from around Union, Missouri back then and they played in a number of towns and counties. He also played with Paul Wilson and his band. Now he’s a member of the Missouri Valley Boys and has been since the band started as he helped organize the band over 20 years ago. John has met a lot of people while playing music and has a lot of friends and he’s still trying to make more friends at Stovall’s Grove where the band plays almost every Saturday night and other places where the band is entertaining so before saying goodbye John would like to say: Hello friends from a real country music man. Ya'll come see us when you can! Delbert Stovall and his twin brother, Delmer were born in Ironton, Mo. April 1, 1924. They moved to St. Louis County when they were small boys. They became involved in music in 1950 when they organized a band, named the Missouri Valley Boys. They have travelled from Kansas to Tennessee playing country music on Saturday nights in their own place of business Stovall’s Grove. Their band plays both Square dances, and Round Dances. Delbert plays Dog House Bass Fiddle, Delmer plays rhythm guitar, Paul Wilson, Fiddle, Jack Tuck plays lead guitar, Rosaline Beach, female singer. 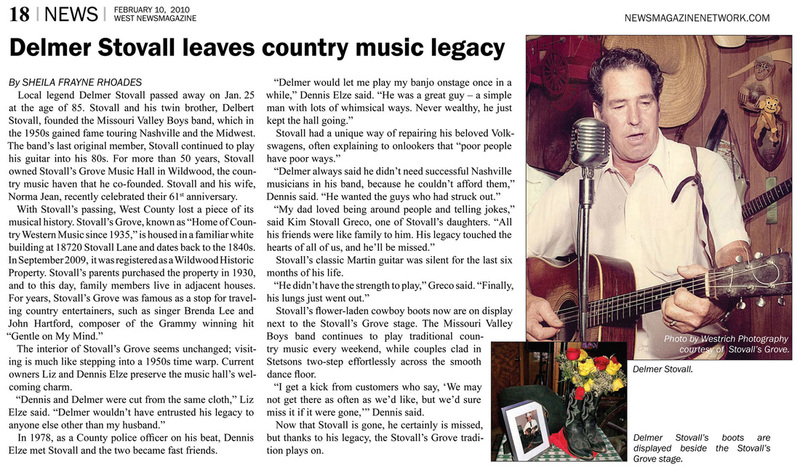 Keeping up the good old fashioned, down home tradition of country music, Delmer Stovall still leads the band he and his brother started 45 years ago. "I just like the music," said Stovall, a Hollow resident. "I haven't done it to get rich or even make money at it. I've done it because I enjoy the playing and the people and the fun of it." It was around 1950 that Stovall, his brother and a few friends decided to combine their musical talents and form the Missouri Valley Boys. Of the original band comprised of the Stovall's, Johnny Augustine, Harvey Walker, John Harness, Cliff Roark, Billy Bryant and Jack Bryant, only Delmer Stovall still takes to the stage with his guitar. Some left the band of their own accord, others, including Stovall's brother, have since died. "My husband loved the music as much as his brother," said Marcedes Stovall, wife of the late Delbert Stovall. Until his death, Delbert played doghouse bass with the Missouri Valley Boys. "He was playing with the band on a Saturday night and died on Monday. I think that's the way most of the people who've played with the band feel about their music." Stovall said it's true of the current group - Jack Tuck, Kenny Hartung and Tom Girard of High Ridge or High Ridge, Sim Gehrst and Ray Ebbern of St. Louis and Dennis Elze of Pacific - who are keeping up the musical traditions begun 45 years ago. "We're country all the way," Stovall said. "But we do the old time stuff, that's the music I like the best. I hear this new stuff, but it all sounds alike to me. It's not the same as the waltzes and polkas and the square dancing music, the old songs people know and can dance or just sit and listen to. This is good foot stomping music." 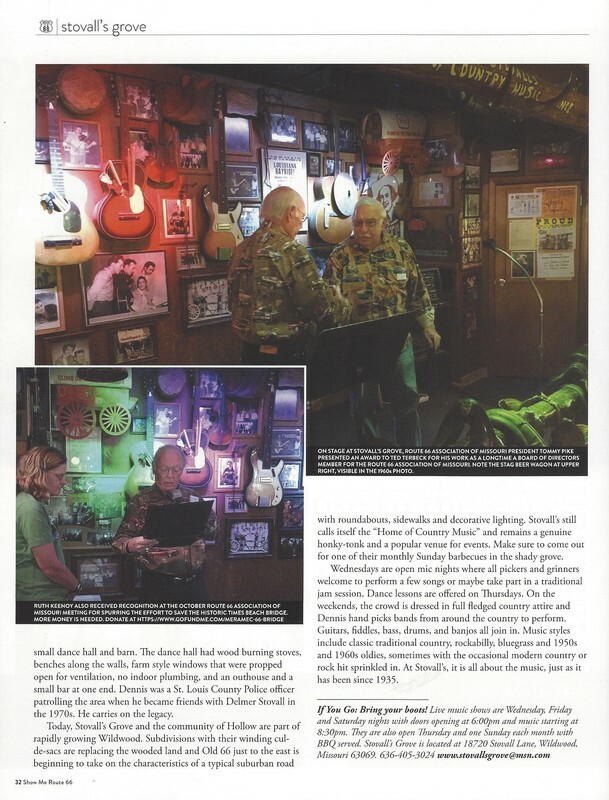 The Missouri Valley Boys are considered the oldest hillbilly band in the country, Stovall said, and the group never lacks invitations to play at company get together, benefits and community events like the Old Rock Church St. Patrick's picnic, where they have performed for 15 years. 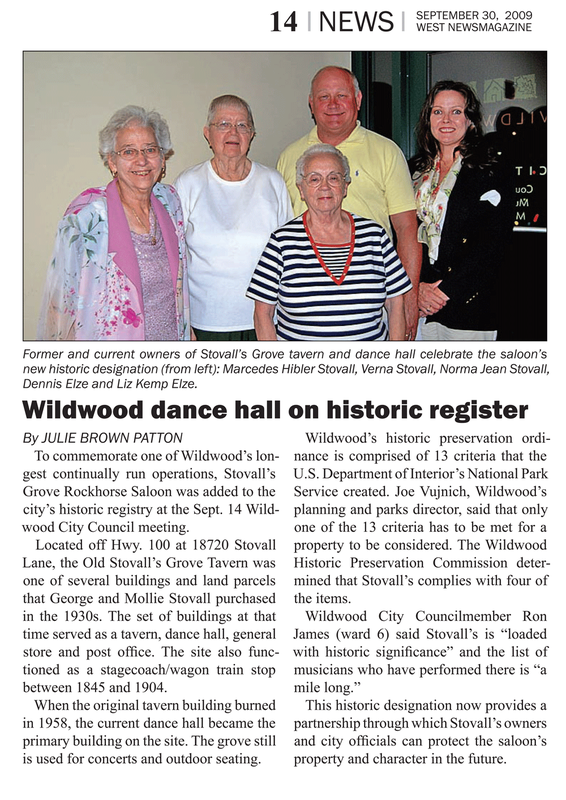 And the band frequently plays at Stovall's Grove, the dance hall in Hollow owned by the Stovall family for more than 100 years. Delmer Stovall and his wife of 44 years, Norma Jean, live next door to the dance hall and their neighbor is Marcedes Stovall. "People like what we do and they keep asking us back," Stovall said. Some famous names have liked what they do, too. Stovall said the band has performed with Roy Acuff, Onie Wheller, John Hartford and Brenda Lee, who had to stand on a soda crate to reach the microphone. Throughout it all, Stovall said his group has stayed true to its roots. Band Members still write much of it's own music, including the band's theme song, "You All Come," and have produced four recordings sold at their concerts. "We never did do any practicing though. You forget what you know when you practice too much," he said. "We just get up and let it go."